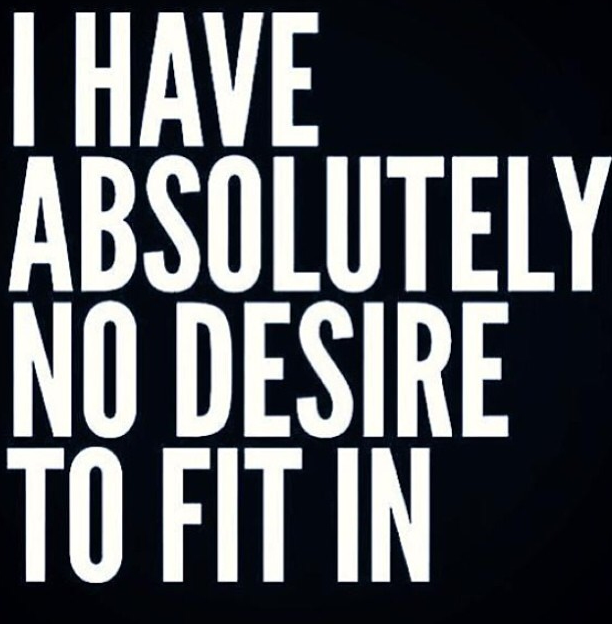 You know…a lot of times I feel like I don’t “fit in” whatever that means. If I had to pinpoint this feeling, I would say it started in third grade when all those sacked out primary kids from another school came up to my school aka the K-5 elementary school. I felt like I didn’t “fit in” with my old friends who were enjoying meeting all the new peeps. Then, we move on to middle school and that was just ick. Unfortunately, I’m not one of those fabulously cool people who don’t give a rip if they FIT IN. Oh to be one of those! I actually do/did care more than a little but not enough to really get in a state of teen angst over it. As I’ve gotten older, okay, let’s not lie…this probably took until about adulthood. You know, the adulthood where you pay your own bills and move in with boyfriend, that kind. I really *started* to be okay with me. 1. I dread social situations. Therein may lie my fitting in problem, huh? Recently, I was talking with a neighbor and sweating buckets. Now, it was 90ish degrees outside, but I was standing there. We were talking. She was nice. There was no need to freak out. She wasn’t asking questions that I was incapable of answering. It was more like, “Now, where do you work? Are you finished with all the house painting?” Easy yes or no’s like that. 2. I eat weird stuff all the time and love it. Like tonight for instance – I had canned salmon with capers, olives, rosemary, mayo, yogurt, and a hot sauce type thing on 1/2 a hot dog roll (toasted). Bi-zarre. 3. I hate doing my hair. I wish that a shaved head could work for me. I have this fear that I am too tall for a short do. Natalie Portman did rock it in V for Vendetta. Same name, same hair? 4. I hate having bad food out. I will pitch a fit about going to a yuck restaurant including any fast food with only slight exceptions for Chik-fil-a and Subway. Now, weird slightly not good food at home is A OK.
5. I love a list, a schedule, a planner…and I keep multiple calendars going. 6. I imagine a target on the back of any person in front of me while running, sinister! 7. I didn’t like kids prior to becoming a teacher – sort of a cart-before-the-horse thing. 9. I hate cocktail receptions. I mean, where is the food? Why isn’t there a meal? Can we sit? No, there is no sitting. I mean, what the???? 10. I could take or leave flowers. Isn’t that weird? They’re nice and everything, but I don’t want to garden. Truthfully, I don’t even really think about putting them in the house when they’re sprouting up outside. People, including me, are all weird in their own way. I think the trick is to just get over your own weirdness and stop being so self-conscious about it. That’s my goal anyway.